And several other places. The photo above is from Gemini Springs, Volusia County Park. Removing orchids from there location is illegal. Orchids are protected species and can only be removed with the permission of the land owner and that would be best to have in writing. We are trying to propagate wild orchids legally to have them available to you as well as to return to wild locations where the population has been removed by collectors or killed off by development. 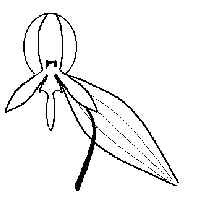 It only take a small amount of seed to flask to legally grow wild orchids so leave the plant and the pod to allow the orchids you find to continue to grow. If you remove a wild orchid and try to repot and grow in a different location it is likely that the plant will not survive. We often here stories of a new species that had been completely removed as soon as someone publishes the discovery, the plants are attempted to be grown and all die thus the new species is now gone. Enchanted Forest: In Titusville, FL near Space Coast Executive Airport. 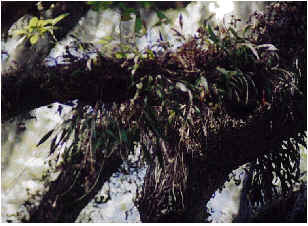 We have found two types of epiphytic and three terrestrials. 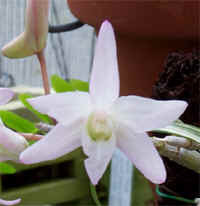 We have been told at some locations close to there you can find some tampensis with pseudobulbs the size of onions! Fort Christmas: In Christmas, FL just north of SR 50. All you need to do is look in the trees and you will see Encyclia tampensis everywhere! The tampensis will be in bloom in June. We was told by one of the rangers that they had been informed of 5 different orchids in the small park. We have not been back to search for the others. Lake Ashby County Park: We have found Habenaria odontopetala. We found a bunch of plants in various places full of brush. Many of them were under Palmettos. High Springs: We found a very small Habenaria in the swaps of a private camping area near High Springs, FL. See the image below. Lake Woodruff: We went for a Sabbath afternoon walk and found a large amount of Spiranthes odorata. Lakes County Park, Ft. Myers: During a brief walk here we found a Eulophia alta and lots of Habenaria odontopetala. Drawing I made of the Habenaria I found in High Springs. We will try to get a good photograph and replace this drawing. This flower is only 3/16ths of an inch from (4.2 mm) tip to tip and a 6 mm spur. Photographed at DeLeon Springs, FL. These are very sweet scented Orchids. Ft. Christmas in Christmas, FL. Look up in the trees around June and they are everywhere!